My friend, Gregie, who currently resides in Japan, sent me a gift a while back. Except he wouldn't tell me what it was exactly. 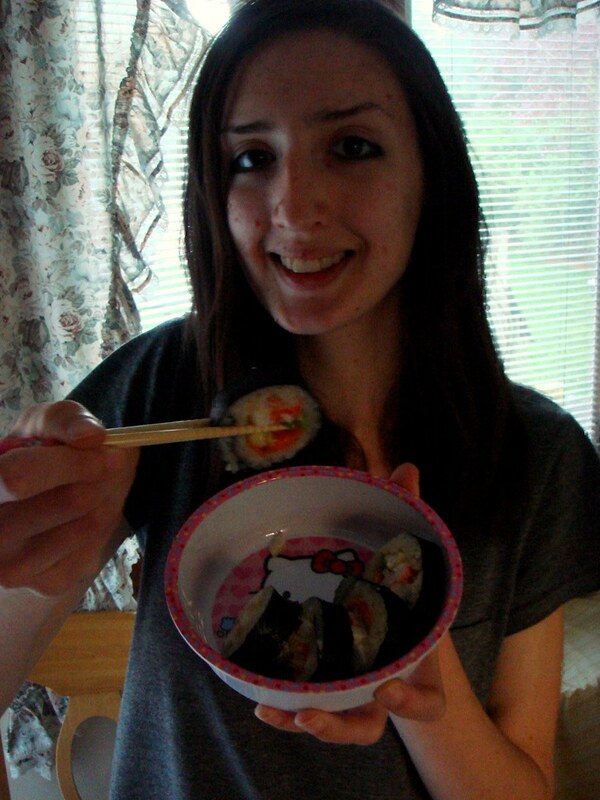 So when it came I opened the box to find a Hello Kitty bowl and matching chopsticks! He asked that upon receiving the gift, I'd feature it on my blog with sushi. Um. This all went down a few months ago. I'm sorry. I obviously was purposely procrastinating not because I thought sushi was out of my skill level, but because I don't really like the stuff. Maybe I'm not white enough (seriously, I'm part Hispanic), maybe I had issues with the texture. Whatever the reason, I remembered the last time I tried some and almost choked to death. No lie, true story. Because of this, I have not used the bowl and cute little chopsticks at all up until now. I felt guilty. And so, finally, I decided to make the sushi so I could use the gift and quit being rude. After finding a really simple guide to homemade sushi through a search on Photograzing, I was on my way. I assembled the required ingredients of sticky rice (which I cooked in the microwave, one of the simplest ways to prepare it outside -- literally, of a rice cooker) which was seasoned (I should have stopped there), nori, the seaweed sheet, my fillings of choice which consisted of carrot ribbons, slivered green onions, and a fake crab filling (I wasn't afraid of using fish, but since I didn't think I'd like the sushi at all I wasn't going to go out of my way to find sushi grade fish, and I knew everyone would be fine with that) flavored with wasabi horseradish, ginger powder, and fresh garlic. 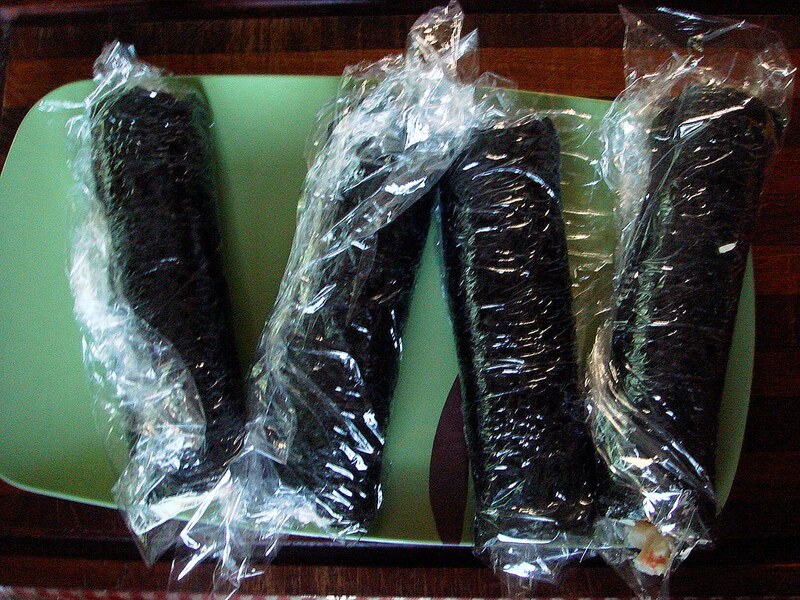 The wooden-not-sure-if-it's-actual-bamboo mat was lined with a sheet of plastic wrap, then topped with a sheet of nori. The rice was patted out, leaving about a 1-inch border at the top, using moistened fingers to keep the rice was sticking. I'm not sure how much rice I used per sheet, but I cooked 2 cups of rice and the entire batch made four rolls. The only difficult part, and it's not all that difficult, is making sure the first roll is rolled over the filling, if that makes any sense. The bamboo mat and the plastic wrap is what you use to aid in making that first roll really compact, which will hold the filling in place as you slice and serve it. Really make it tight. After this, I lifted the mat off and kind of peeled the plastic wrap off that got stuck in the center a bit, then I proceeded with the rolling of the sushi. Press tightly when you get to the end, and use the ends of the plastic wrap to hold the roll in place. Refrigerate it while you prepare the next roll. I ended up with four rolls of sushi. You're supposed to slice these with a really sharp knife, which apparently I don't have, but I had excellent results using a serrated knife. I was very, very happy with the results, and it looks so pretty, especially in my Hello Kitty bowl! But. Sushi just isn't for me. I'm not counting out sashimi, but sushi, I don't know, I cannot eat it. At least the traditional version. Maybe a dessert sushi, or a sushi with a thin egg omelette wrapper instead of nori. In fact, this slice of sushi was the only slice I was able to eat. I definitely liked it better dipped in soy sauce, which kind of masked whatever I didn't like about it. Until I ate it. So I had a lot of fun making it, at least! And now I can go around telling people I made sushi and listen to their praise, which will make up for not being able to eat it. General instructions for making sushi -- The rice seasoning liquid was incredible. I think I'd prepare the rice like this again, but serve it with a stir fry. Microwave sticky rice recipe -- Don't have a steamer or rice cooker? No worries. 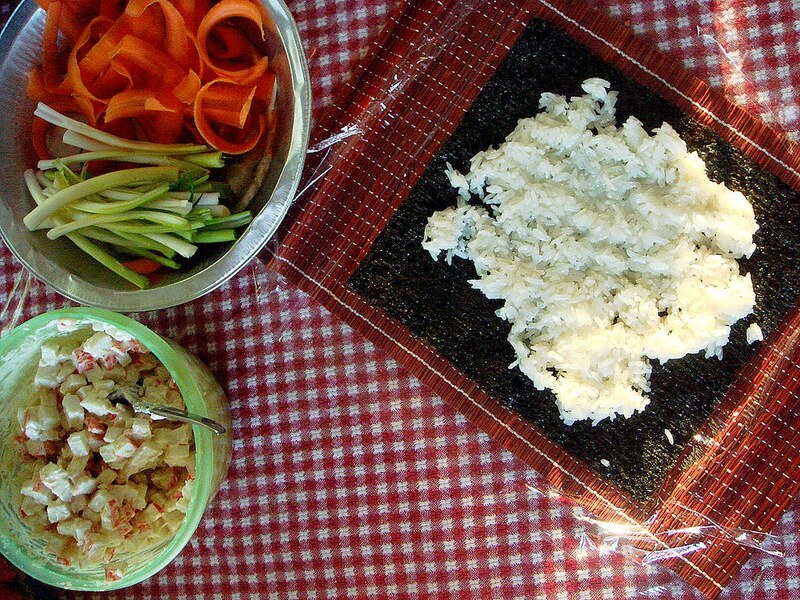 You can easily make sticky rice in the microwave! I suggest going to an Asian market/store to find the ingredients needed, like the nori sheets, rice wine vinegar, etc., because it will be cheaper than buying it from the ethnic section of the grocery store. Obviously, go to the grocery store if that's the only place available. I'm impressed. That looks good. Great job! It looks really good. I love sushi, but not sashimi. Props to you for making something that you wouldn't normally enjoy! They look delicious! 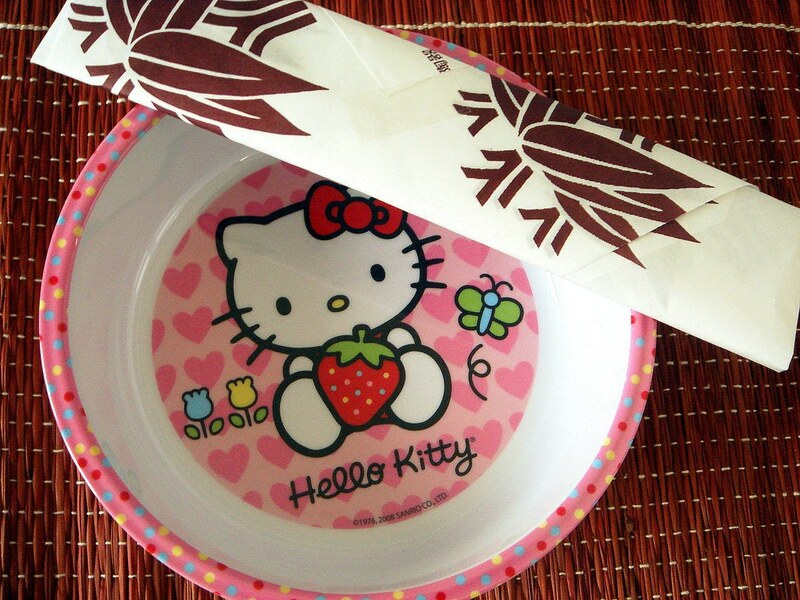 :) And the Hello Kitty stuff is very Japanese! Now I want to go make some rolls too!! Geez, you guys are fast today! Esther ~ Ah, okay. I guess in America sushi is used to mean everything rolled in rice. I also might have looked it up first. Anyway, thanks for the clarification! 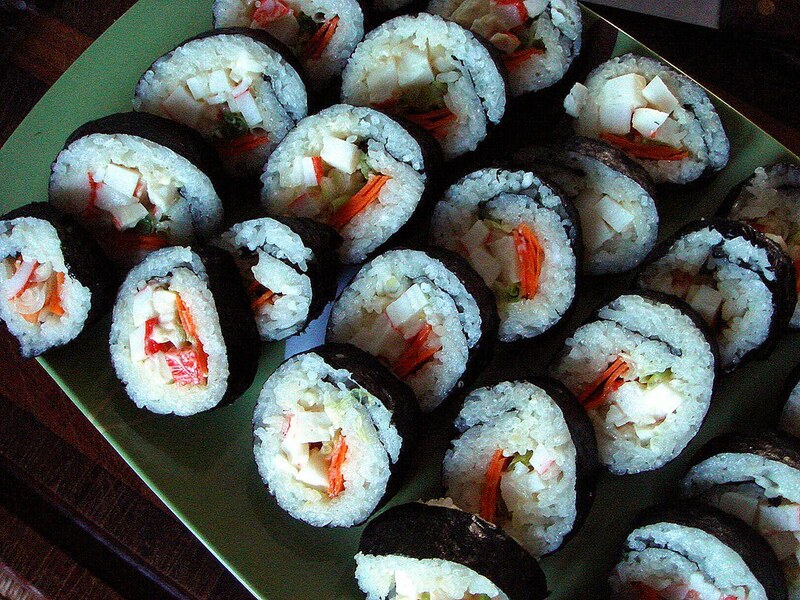 Natalie ~ :hail: the rice krispie/sweedish fish sushi! It took me awhile to like sushi, and I still prefer maki to full-blown, hunks-of-raw-fish sushi. However, in receipt of such a cool gift, sushi-making was definitely in order! Super cute! 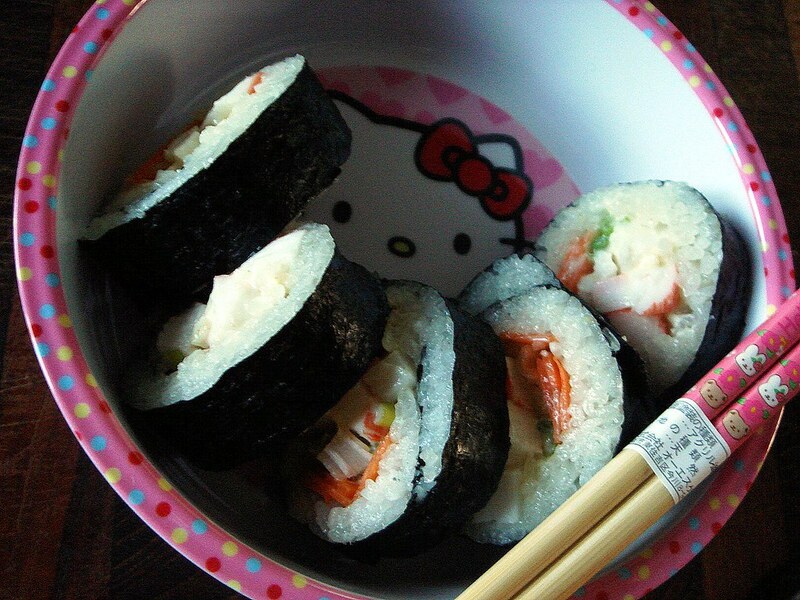 I like that Hello Kitty bowl and matching chopsticks. Matches well with sushi too. 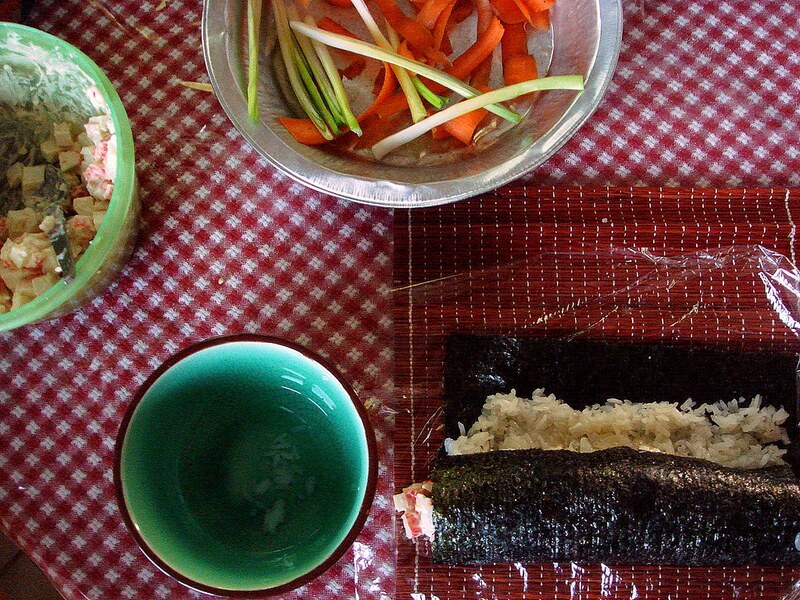 Making homemade sushi is good fun. Have a great weekend. Cheers! yay for homemade sushi! i love making my own at home, but i never use the vinegar in my rice (i've never liked the taste). and love the hello kitty...she's my favorite. I can't believe this was your first time making sushi! It looks perfect! I've never tried before, but now I have the urge... looks great! Homemade sushi?! Absolutely amazing. There are classes at the local community college that I'm going to definitely have to sign up for. PS, your Hello Kitty gear is fabulous! it's been so long since i've posted, so i'm sorry that i've also missed your posts! the hello kitty bowl is so adors. and homemade sushi is always so yummy. As someone who is surrounded by numerous take-out sushi places, I'm quite impressed at how pretty and well-pressed your first attempt was! Your pictures are crisp and beautiful. 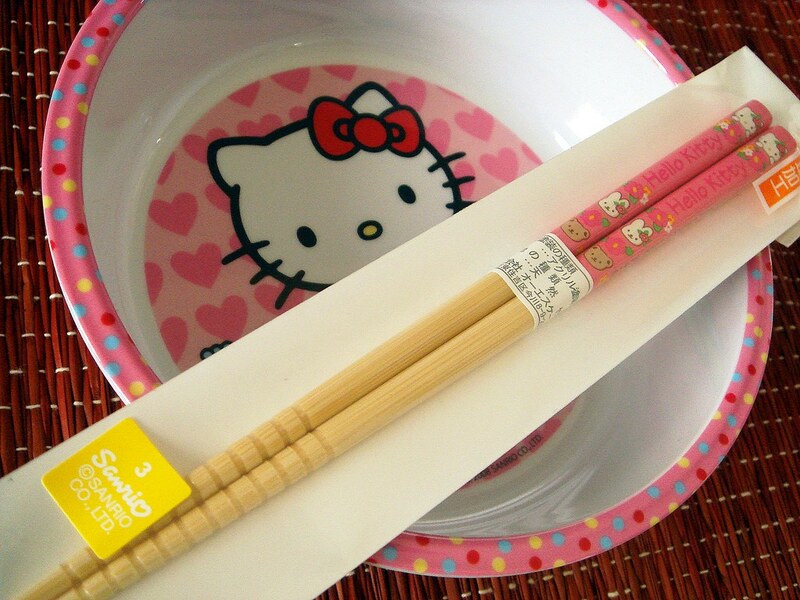 And the Hello Kitty bowl and hashi (chopsticks) are too kawaii (cute)! FYI, Sushi doesn't require raw fish at all. 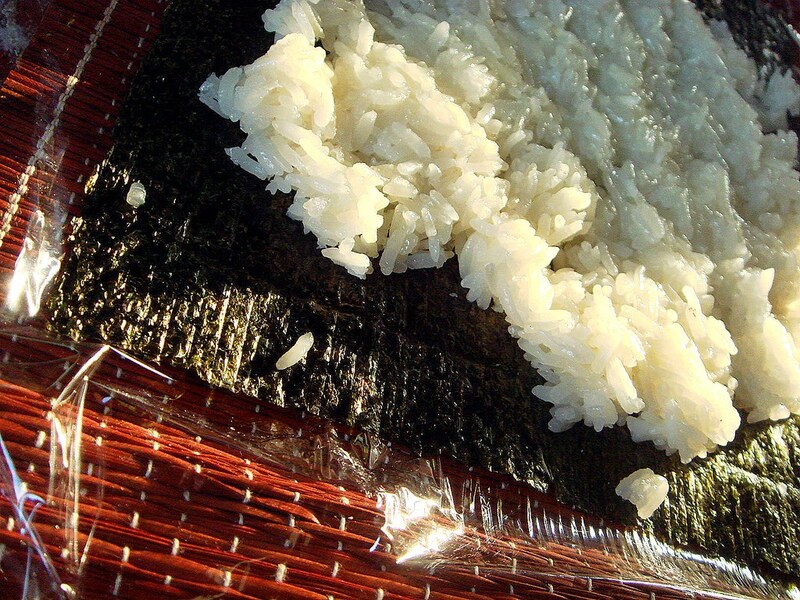 Sushi refers to the rice, which is sticky rice mixed with a combination of rice vinegar, sugar, and salt. It is mixed in while the rice is still hot to absorb the flavor, but fanned in between mixing to cool down quicker. Sashimi is the thick slices of raw fish and has no rice at all. 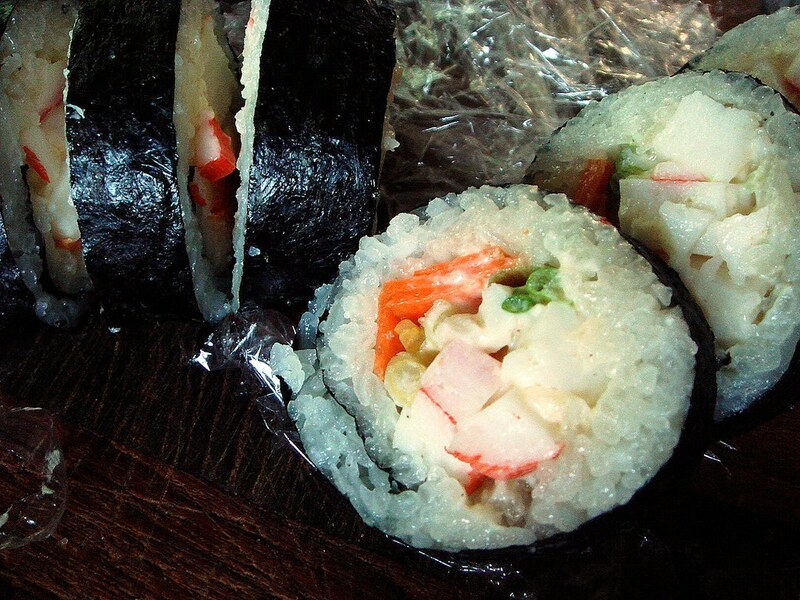 There are many types of sushi that have no raw fish at all. Here in Hawaii, it wouldn't be unusual to find maki rolls (the ones that are rolled up) featuring kalbi (Korean short rib), chicken katsu (crunchy Japanese cutlet), teriyaki beef, even 'breakfast' style rolls with Spam or Portuguese sausage and scrambled egg. I loved your comment, 'and stop being rude.' haha. I SO understand the procrastination of things-I-mean-to-write about. I have drafts of posts hanging out and floating around... and around... good for you for making sushi!! wootwoot! I HAVE THE SAME BOWL!!!! !